Visit Opatija, Croatia during the off-season (spring and fall) to fully appreciate it. The town became a popular resort for the international elite and Austrian-Hungarian nobility in the late 19th century. Although, since that time, Opatija has fallen into a slow decline, it still attracts many tourist and it is especially popular in spring and fall. I've already written about the reasons why you should not visit Opatija in summer. Now I want to do a justice to this resort town, and let you know why you need to visit Opatija during the off-season. It still has a lot to offer to its visitors, and it is a charming town. You just need to know when to visit. And in my opinion the perfect time to visit Opatija is in spring and fall. Located between mountains and the sea, Opatija has always been known for its pure air and health beneficial aerosols. Since 19th century, visitors have been coming to Opatija to improve their general well-being. Today many Opatija hotels feature spa & wellness centers. Most hotels feature interior swimming pool with sea water for maximum health benefits. It's a great place to spend a wellness break. Opatija is often called Vienna by the sea due to its history and architecture. The town center still contains a great number of 19th century buildings. Its three parks, Angiolina Park, St. Jacob Park and Margarita Park, are monuments of garden architecture. They feature over hundred different varieties of plants originating from all over the world. Its seafront promenade is a hundred years old and 12 km long. It is perfect for easy and pleasant walks by the sea. Another walking path is 5 km long Carmen Sylva forest promenade. 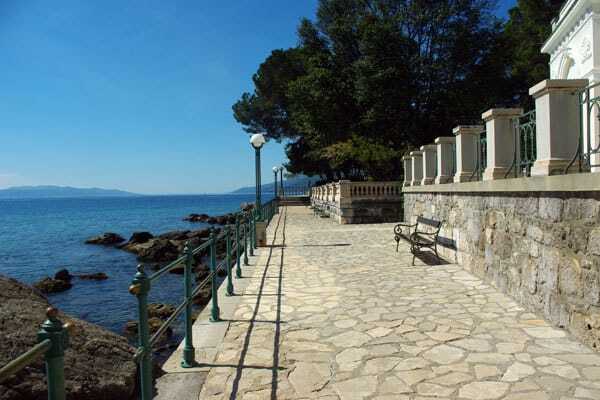 Opatija is truly a great place if you enjoy long strolls through the parks and by the sea. If you ask me, a perfect weekend break needs to include plenty of nice things to eat. And Opatija is a right place to do just that! From classy seafood restaurants to bistro style dining, it has something for everyone. The one thing in common to all these restaurants is really tasty food. Fishing village Volosko is the real deal with its charming harbor and al fresco dining along the sea. My favorite place is konoba Tramerka. Kastav, a charming hilltop town, is another gastronomy gem. Check out a fine dining restaurant Kukuriku. Or just enjoy local and casual dining at konoba Pul Kukuriku. The outdoor terrace offers amazing views over the bay. In Opatija itself, the hot spot restaurant is a restaurant Bevanda. Opatija is famous for its cafes. Many people from Zagreb go to Opatija just for a day to have a coffee at one of its terraces. Take the moment out of your day and enjoy an espresso or cafe latte in one of numerous Opatija cafes. Regardless of the weather, watching the world go by on one of seafront terraces is the ultimate activity in Opatija. Check cafe Wagner for its homemade praline or cafe Kvarner for its homemade mignon. Avoid hustle and bustle of summer crowd and profit of favorable accommodation rates of Opatija hotels. Accommodation rates drop down significantly in spring and fall. Do you like weekend breaks? Where do you usually go on a weekend break? Let us know in the comments below? We are going to Opitija during third week of September. Does that fall into your “good time to visit”? Will be trying a couple of the restaurants as we love good seafood and good wine! Thanks, Jessica! Hope to see you in Croatia. Thanks, Nicole! Let us know if you come back, we’ll love to show you around. Love your story, btw, truly inspirational. Safe travels, and good luck with all your blogging projects. Love this post! We were invited on a press trip to experience the food and culture of the Kvarner region this past Fall and I can’t imagine a better time to visit. I wish we had additional time to explore Opatija on our own, but we were on a tight schedule afterwards. I definitely want to head back this year and spend a few days — friendly people, incredible food, and surprisingly great wines. We thoroughly enjoyed Opatija! And will defl check out this Sunday Traveler — I haven’t heard about it before! Thanks for stopping by, Erin! I’ve checked your blog. And just like you, I am more a red wine person, but here I learnt to appreciate white wine too. Let us know if you decide to visit, we would love to take you for a lunch. I am currently close to Opatija, yes it is cute! Hi Monika, Opatija is pretty. If you’ve done redesigning your site, come this Sunday to join us for the #SundayTraveler. Thank you! I did check it out but I am not on social websites like Twitter, Is that a must? Not a must. Though, it helps if you are at least on some of the sm networks. This looks like such a cute place! I’m currently dream-planning my trip to Croatia so will be filing this away. I would definitely enjoy sipping a coffee on one of those gorgeous terraces! Thanks Heather! The coffee culture is really strong in Croatia. People love to have their coffee outside, and to take their time while enjoying it. Great recommendation – off-season is always the best. With you and Mrs. Chasing the Donkey singing the praises of Croatia, it’s hard to pick someplace else for our next southern European destination. Hahaha, Dave. Hope to see you here. Thanks, Samantha! I too never mind to get a nice, relaxing massage :). Since I’m thinking of going to Croatia during that time of the year, and only staying within the Northern part of the country… do you think it’s a better option over one of the nearby islands? Hi Ann, thanks for your comment. If you are coming into the Northern part, and in the off-season, you’ll be better in Istria than on the one of the nearby islands. You can visit Krk for a day (connected with a bridge to the mainland) or Cres (a short ferry hop). I could use a nice wellness break right now – a place with good food and nice walking paths by the sea sounds about perfect! lol, Kelly! Glad you are developing an interest for Croatia. Let us know if you visit. I agree – the best time to visit Opatija is during the off-season. I spent a very pleasant New Year’s Day there which I wrote about recently on Istria Outside My Window. I also really like the nearby town of Lovran and love the seaside promenade. Thanks, Isabel. I read your lovely article about New Year’s Day trip. Love that old road by the sea from Istria to Opatija. Well, I can definitely see how Opatija would improve my well-being… Croatia just keeps on giving! Lovely post, guys. Good luck! Aerosols… although, they say that there is lots of laurel planted around, and vapors can make people go crazy :-). Don’t know if it’s true. Okay fine… I am on my way. Frank, where can I sleep? Good point! Should add few suggestions on accommodation. They are renovating hotel Kvarner (the first Croatian hotel; built in 1884); So in 2014 that will definitely be a place to go. Oh gosh – another stunning set of photos from another gorgeous place in Croatia…. We loved traveling through Croatia in the off season. The weather was still beautiful, but the crowds were so much thinner. I couldn’t imagine some of the places we visited in the summer! We had wanted to visit Opatija (It cam highly recommended by a few friends), but we just couldn’t fit it in during our all-to-short stay! We will definitely add it to the list for next time though! Safe travels! Yes, Travis. You still have a chunk of the country to discover. So there is a reason to come back. Let us know if you do so. We would love to show you around. My favourite fish restaurant until I visited Tramerka was in Valun, on Cres. Its called Na Moru. The fish is always perfectly cooked and the service is great. The restaurant is right next to sea, with great views. The stolno Malvasia is some of the best that I have tried. We also like Santa Croce in Rovinj – again really good seafood including excellent carpacio of brancin. thanks for the tip. I know about Santa Croce, although I haven’t eaten there myself. I will certainly put it on my list for this spring / summer. Na moru is now a good reason to visit Cres again. Happy to share that there is a new old place opening in Rovinj tomorrow. Kantinon, I don’t know if you are familiar. The place is revamped and a new menu will be introduced. I will report back on the quality. Mnay thanks for the tip about Konoba Tramerka – the best seafood that I have had in Croatia. thanks for your comment. I am so happy that you have enjoyed it. Is there any other place you have visited and would recommend me to check out?